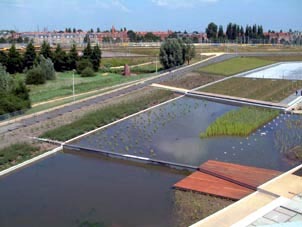 The Westergasfabriek Park in Amsterdam opened on September 7 by Mayor Job Cohen. Floortje Louter and Jaco Kalfsbeek were there to witness the promising start for a park that will reach maturity in the coming years. 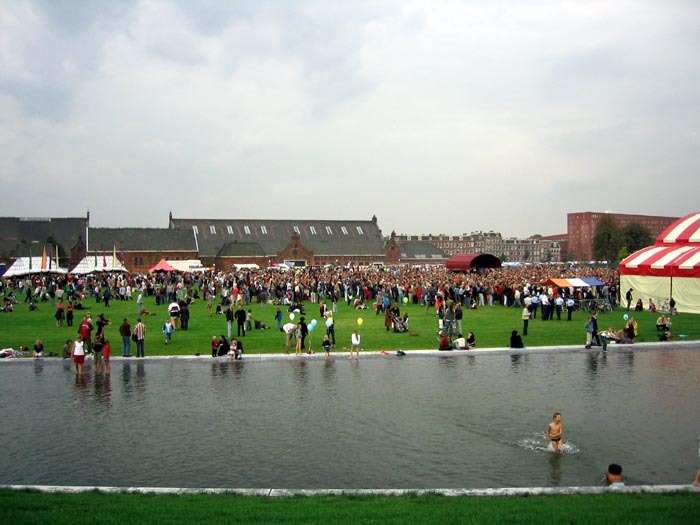 Before the construction of the new park started three years ago, numerous cultural organisations and artists made use of the buildings on the Westergasfabriek site. The regular staging of festivals, exhibitions and performances put the location firmly on the map for people from Amsterdam and beyond. Gustafson's design provides for the continuation of such events and happenings. 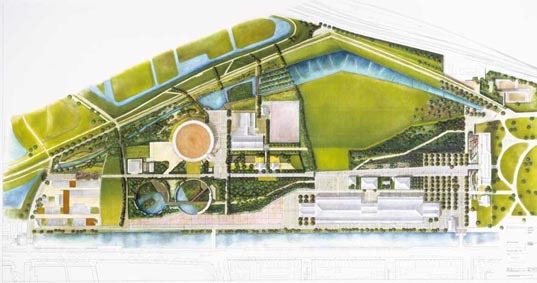 The Westergasfabriek forms an important link in the Bretten Zone, a green corridor that begins in the park and extends along an area of allotment gardens, a cemetery and Sloterdijk Station to beyond the city limits. A monumental water feature and a central axis connect the existing, older section of the park, executed in the landscape style, to the new area. This area has an open feel to it and a clear structure. The different buildings and zones are arranged on both sides of a central axis finished in granite. Water plays an important role in the design. The park is structured in such a way that surface water is purified on site by aquatic plants, waterfalls and cascades. From the elongated leisure pond the water flows through the Cypress Pond, the Reed Pond and the Theatre Square Pond before entering a romantically meandering brook. There is a smooth transition from the park to the bordering green zones. The basements of two former gasometers now house a water garden and lily garden. 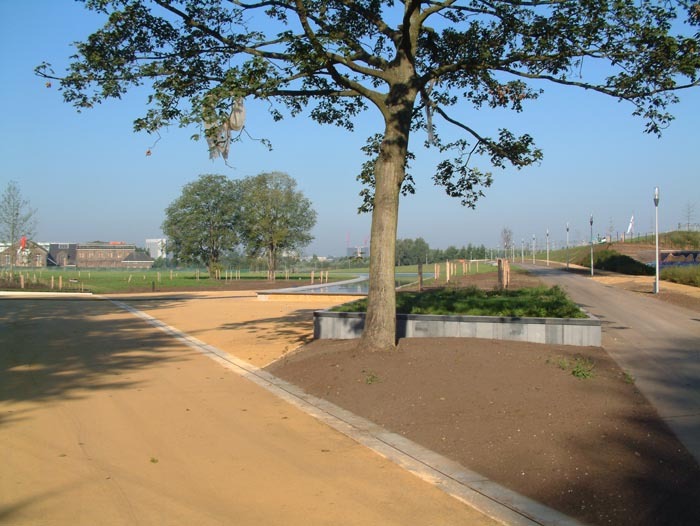 A cycle and pedestrian route through the park extends past the water and along a dike that screens the park from the railway line. A striking feature is the large and rolling expanse of grass intended for staging events. The grass has been strengthened underground so that it can withstand heavy traffic and large crowds. Lessons have clearly been learnt from the Museumplein, and everyone is keen to avoid the attendant cost of continuous repairs. The park design is modest, the choice of materials precise and subdued, and the detailing refined. One can, however, question the decision to enclose intensively used areas with so many planted verges and fragile edges. 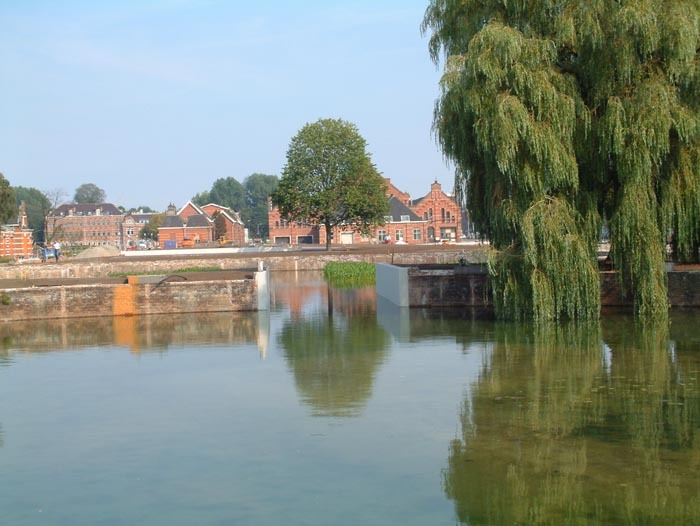 But the borough has set aside the yearly sum of 500,000 Euro for the maintenance and intensive management of the park. 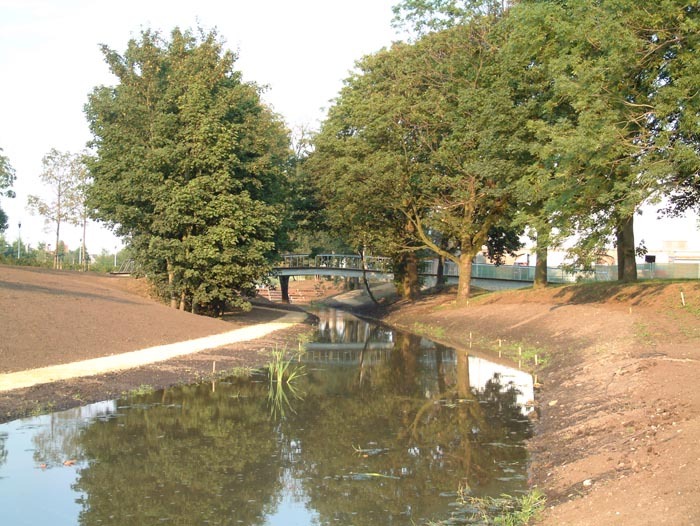 All in all, Amsterdam now has an attractive, new city park. Restoration and development of the buildings will hopefully follow quickly. Whatever the case, we'll continue to come here to witness how the park is maturing, and we recommend that others do likewise. The scheme by landscape architect Katryn Gustafson was awarded first prize in an international competition. Her task was to design an area with the status of a cultural city park and a neighbourhood park for nearby residents. An important concern was the industrial history of the site. For over a century the Westergasfabriek site was used for the production and storage of gas. After the introduction of environmentally friendly methods of energy production in the 1960s, the plant ceased to operate and the site lost its function. But right up to the 1990s the Westergasfabriek functioned as a storage depot for the city energy company. Ownership of the site and buildings transferred to the local borough in 1992. The heavily polluted soil and the neo-Renaissance industrial structures designed by architect Gosschalk around 1880 – no fewer than 16 buildings were accorded the status of protected state monuments – raised questions about how to deal with industrial heritage at such a central urban location, an issue that exercises minds around the world. After the completion of Museumplein in Oud-Zuid, Westerpark is the second Amsterdam district since the decentralisation of the city administration to bring a large and complex project for public green space to a successful conclusion. And with the prospect of the Bijlmer Park in Zuid-Oost and the Flora Park in Amsterdam-Noord, a benchmark for high-quality public space has been set. The choice of internationally acclaimed designers, backed up by an ambitious team and with direct input from residents and users, seems to have paid dividends. 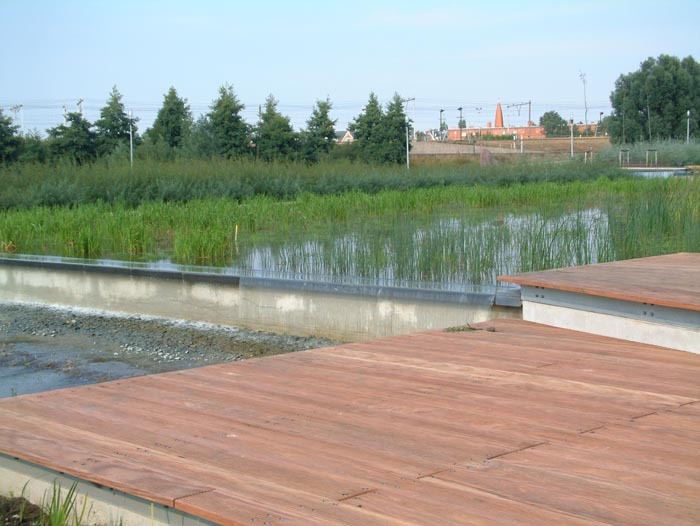 After more than ten years of planning, consulting, cleaning and constructing, the Westergasfabriek Park was festively opened on Sunday September 7. The earlier completion of the park was postponed owing to unforeseen delays, and on Sunday it was clear that the park is still very much 'under development'. Which is why the park was expressly declared open rather than finished. That said, the broad outlines of the design and the cultural potential of the location were clearly visible.